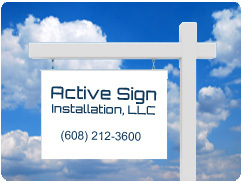 Active Sign Installation installs, removes repairs and delivers your residential real estate signs in Madison and Dane County 5 days per week. Areas outside of Dane County can be serviced by our company for an additional fee. We store your signs and name riders at our shop so that when you send us an order, we can take what we need in order to fulfill your request. Communication and Customer Service are our keys to success. We keep in constant contact with you via e-mail, fax and phone to make sure that you are getting the service you need. Each quarter you will receive a list of where our records indicate you have signs. By comparing our list to your active properties list, we can make sure no properties slip through the cracks. If a sign is up that shouldn't be, it will be removed immediately. This results in happier sellers/buyers as well as fewer lost posts and signs.